You have just closed a translation unit, you moved to the next one, and you realize that there is an error, what do you do? Deja Vu: You press (Up arrow / Ctrl+arrow) to move to the previous translation unit. You make your edit. You press (Ctrl+Down arrow) to save/"close" current unit and move to the next one. Go to the General options, select the Shortcuts tab, click button Default, then click OK. The command Select translation and open next TU should now have a shortcut. To change the shortcut, just double click the item in the shortcut list. Trados: You select the word or phrase you want to search in the concordance and you press (Alt+Up arrow). The results appear in a new window. In Options->Translation Memory options, Concordance tab, you can check the box Start concordance search if no segment match is found to start the concordance search automatically. If when using the concordance you realize you have to use a lot the (Alt+Tab) shortcut to move between your file and the concordance check the box "Move cursor into concordance dialog box after search" in the same tab. It is not always easy to copy/paste words/phrase into your project as formatting will also be copied creating havoc in your segment (one solution for this is to use a macro to Paste Unformatted). When it comes to Greek some times you may have trouble with the fonts being corrupted and instead of Greek seeing extended ASCII gobleddygook [Problems with unicode fixed with version 6.5.5 or greater]. The search for contexts will be done first in the regular translation memory. If no matches are found then it will be carried out in the reference (Read-only) translation memory. (You can add a reference translation memory Options->Translation Memory options, Concordance tab, click the Browse button next to the Reference (Read-only) translation memory field to select a reference translation memory. Wordfast: The concordance search is called Context search in Wordfast. You select the word or phrase you want to search in the concordance and you press (Ctrl+Alt+C). The search for contexts will be done first in the background translation memory (if applicable), then in the regular translation memory. The purpose of Context search is to find Translation Units (TUs) that contain a given word or a set of words. The search results appear in a new Word window. You can easily copy/paste words from search results into your normal text. The search will bring results on words that begin like the searched-for item, case-insensitive. Searching for cat will bring TUs that contain cat, or catering or caterpillar, etc, but not bobcat or supercat. Searching for *cat will bring TUs that contain words like bobcat or supercat etc. The OR/AND operators can be used. Searching for cat+dog will bring TUs where either cat OR dog are found; searching for cat&dog will bring TUs where both cat AND dog are found. 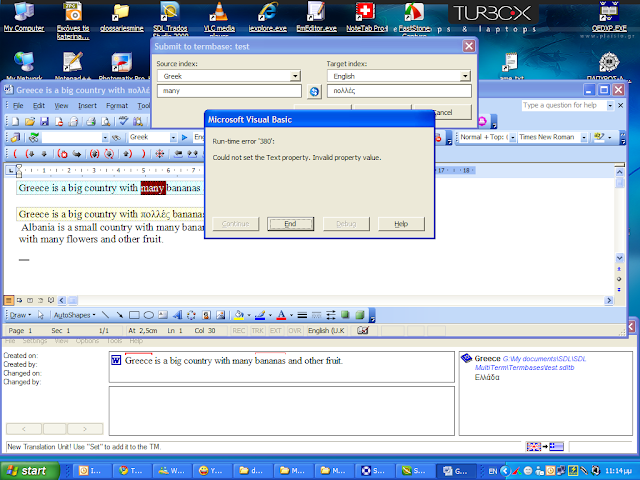 Note that to open the dialog box that lets you specify such extended search options, you must start context search when no selection is made; if a selection is made (for example, one word is selected in the source segment), then Wordfast assumes that the selected word has to be searched and will directly search for it, without offering the extended search dialog box. This allows fast searches with minimal clicks or shortcuts. The same rules apply for Reference searches as well. If you check the Search contexts in all sibling translation memories option in Wordfast->Terminology->Other, the context search will be extended to other TMs present in the same folder as the currently active TM. It is possible to cancel a Context search with the Escape key, or with the same shortcut that started the search (i.e., Ctrl+Alt+C). Deja Vu: The concordance search is called Scan (Scanning the Translation Memories). You select the word or phrase you want to search in the and you press (Ctrl+S). There is also the AutoSearch which can make Déjà Vu X Professional automatically scan (search) the translation memory for the current segment, and search the translation memories, terminology databases and the project lexicon for any portions of the sentence. Results appear in a pane of the same window. It is easy to copy/paste words/phrase into your project. Another feature is Filter on selection. You select the word, right-click on it and use the Filter option, and it shows all the occurrences in the current file. MetaTexis: Click on the menu command: MetaTexis | Translation memory (TM) | Display TM where selection is in source text (default shortcut: Ctrl+Alt+T). The segments containing the source text will be displayed. You can also search for a target text word Display TM where selection is in target text (default shortcut: Ctrl+Shift+Alt+T) which is something quite beyond Trados. However, Trados provides highlighting of search term and an interesting similarity algorithm which MetaTexis lacks. Another option is the search function (Alt+Shift+I). Unlike the internal Microsoft Word search function, the MetaTexis search function does not go to the next place where the text searched for was found, but presents you with a list of all translation units where the text was found. Click on the menu command: MetaTexis | Navigation | Search for text (Alt+Shift+I). A dialog box will be displayed, in which you have to click OK to see source text matches. You can click advanced to search the translation. The search word is highlighted in the bottom part of the search window which is split into two boxes with full view of source and target segment. The upper part, with single line view, does not provide highlighting. A drawback is the fact that a dialog box comes up instead of seeing the matches instantly. The difference is only in the way the databases are used by the program during the translation process. Secondary databases can only be searched while you translate, whereas main databases are the ones you "work with". It is notable that MetaTexis can search up to 256 different TMs (although I would not recommend it)! Version "MetaTexis NET/Office" offers great flexibility regarding the database used as TMs. You can not only use local MetaTexis databases, but also the TRADOS Workbench. Move to source segment (Ctrl+Tab). Select source term press Ctrl+Alt+T. If you find a repeated expression in the source text that you wish to add to the term base, select it and press Ctrl+E, or, from the Operations menu, choose Add Term. The Create term base entry dialog box appears. In the text box on the right, enter the translation of the word or expression, and then click OK. memoQ will immediately add the term pair to the term base. Further occurrences of the term will automatically be highlighted. If the target cell already contains the translation of the term you want to add, you can select both the source and the target expressions, and then press Ctrl+Q, or, from the Operations menu, choose Quick Add Term. 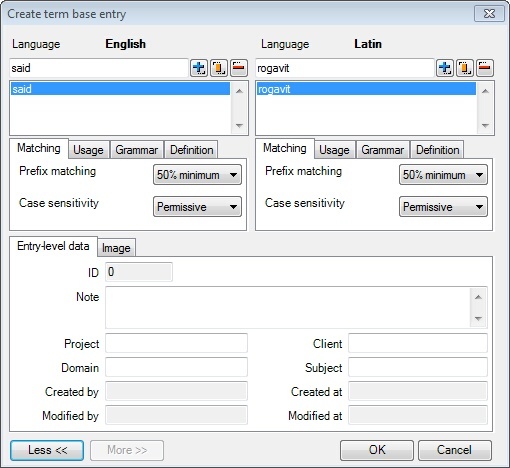 memoQ will automatically add the term pair to the term base without displaying the Create term base entry dialog box. 1. Select the source term. Click CTRL-ALT-T.
2. Select the target term. Click CTRL-ALT-T.
3. Term window appears. Press Enter, window disappears, term added. 2. Term window appears. One has to type or paste the target term here. I can see no keyboard shortcut to add the term, so an extra click is needed or 3 tabs and Enter. 3. Term is saved to default glossary silently, or, if this is too much to ask, at least be able to just press Enter or a shortcut rather than click.